Some new post-apocalyptic designs for the B Pose Dames to match the designs I did for the C Pose Dandies. I had a lot of fun with these, though like a lot of my post-apocalyptic stuff, they are not terribly practical. 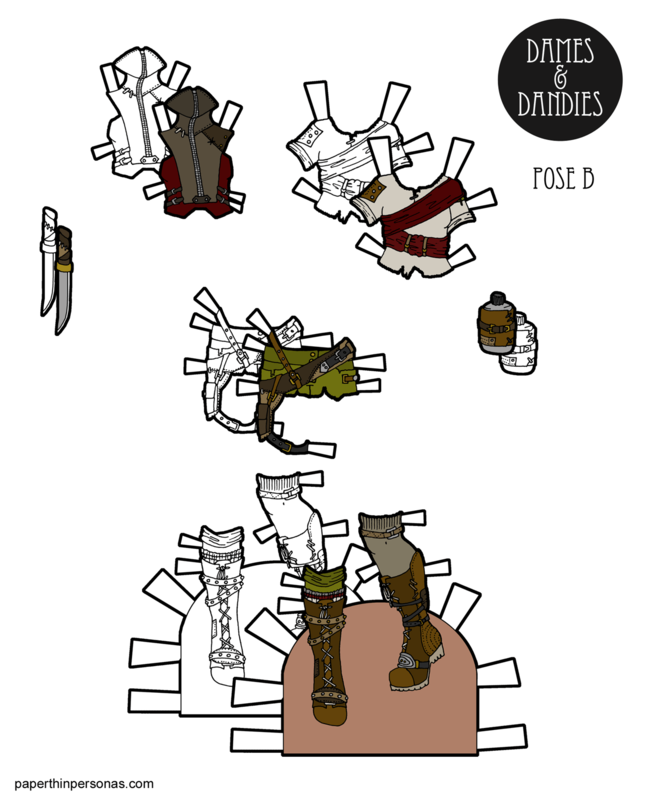 Still I never let practicality get in the way of my paper doll designs. I love Post-Apocalyptic designs for clothing. I collect them on a Pinterest board for Post-Apocalyptic Fashions and one of the inspirational images was this one. You can see these in my sketchbook on Instagram or if you’re a Patron you got to see it a few weeks ago. Confession: I am super tired and so this is going to be a short post. Let me know in the comments, if you think the A Pose Dames need some post-apocalyptic fashions to fit in with their B & C friends. I second your “tired” and raise you a “school vacation week”! It’s a miracle I’ve been able to get anything done. Your shoes are always magnificent. And I love how your post-apocalypse fashions always looked cobbled together. It’s not like you’re going to find cute matching knee socks at the end of the world!! Yeah, but you have to wonder- would anyone even wear cute knee socks and short shorts in the end of the world?